A bronze vessel of cylindrical form with a slightly domed lid, supported on three short cabriole feet. The straight-sided body is divided into two sections by a slightly raised, channelled band in the middle, and there are two further raised bands around the rim and the base. Looped ring handles are attached on each side. The lid has a single, square finial in the centre. The bronze is covered in an attractive emerald green patina, with significant areas of ruby-red encrustation. The inside of the lid has a lapis lazuli patina. 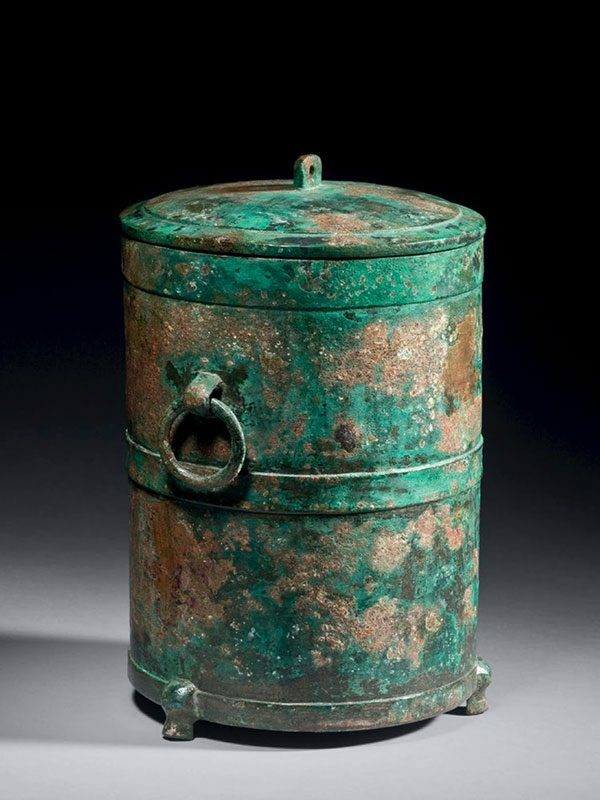 Cylindrical bronze vessels made their first appearance during the late Eastern Zhou period (770 – 256 BC), the shape remaining popular during the Han dynasty. 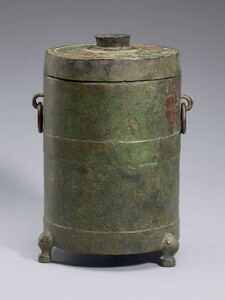 Describing a vessel of similar form in the Meyintang Collection, Wang states that “This type of cylindrical bronze vessel was named lian in the catalogues of the Song and Qing dynasties and described as a toilet box. In the 1960s, however, archaeologists found a number of similar vessels in a Western Han tomb, bearing the name zun. They were used to warm wine.” Also according to Wang, the form derives from a wooden or lacquer prototype, rather than from a ceramic one. A nearly identical zun of closely comparable shape and proportions, dated to the Han dynasty, is in the collection of the National Palace Museum, Taipei; the only significant difference being the form of the finial, which in this example is circular and knop shaped (fig.1). Two other Han dynasty bronze zun of similar form, with an additional chain handle connecting the side rings are respectively in the collection of the National Palace Museum, Taipei  and the British Museum.